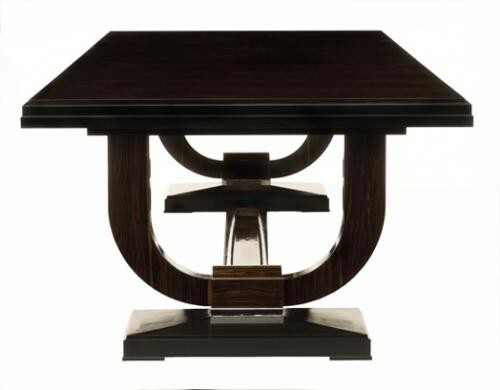 This Art Deco Dining table with a two lyre supports was originally designed by Jacques-Emile Ruhlmann for the Hotel Ducharne. Veneered in Macassar Ebony, it features a stepped black lacquer edge and base. The definitive Art Deco lyre supports are decorated with silver detail. The table is finished in lacquer which reflects the light and adds depth to the wood. Called the "Daniela Dining Table"